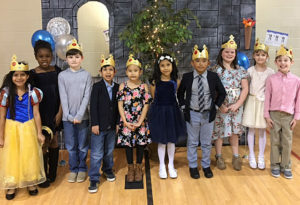 Students from Mrs. Kimberly Brock’s 2nd grade class (from left) Adriana Sandoval, Neveah Blackmon, Gavyn Pollard, Jose Osio, Geraldine Vega, Aby Tovar, Jake Vega, Kaydence Miller, Melanie Thetford and Preston Johnson attended Benson Elementary’s Fairy Tale Ball. Benson Elementary second grade students practiced the art of dance at the school’s Fairy Tale Ball on March 27. Students were taught the waltz during by their physical education teacher Anthony Thorpe, practicing during class over the last several weeks. The students’ family and friends were invited to attend the dance to see the students show off their newest dancing skills. The school’s gym was transformed into a magical dance floor. The students, dressed in their finest attire, entered the ball through castle doors with their partners, and sang a waltz song before they performed the dance.